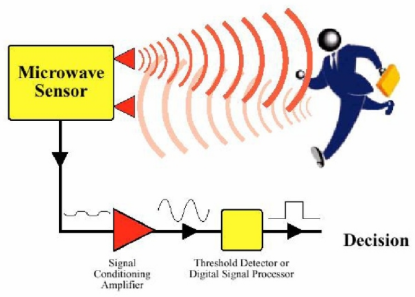 A new product of crowtail family, it’s a microwave sensor module which is applies the Doppler effect to detect moving objects using microwaves. This differs from the method used by a regular infrared (IR) sensor as microwave is sensitive to a variety of objects that are microwave-reflective, and its sensor readings are not affected by the ambient temperature. This type of sensor is widely used in industrial, transportation and civil applications such as measuring vehicle speed, liquid levels, automatic door motion detection, automatic washing, production line material detection and car reversing sensors etc. The following diagram demonstrates the working principle of the sensor module. 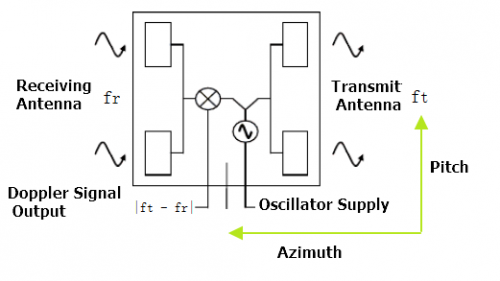 It works by amplifying a tiny signal which is received by the microwave sensor, and then through the comparison circuit it converts the signal into a square signal with a digital output of 0 or 1 which an Arduino or other micro controller can easily handle. 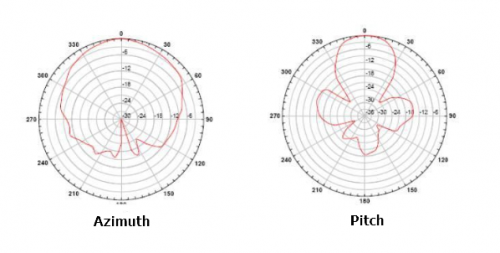 Detection Angle: The angle of detection is 72 degrees with the antenna in a parallel direction (azimuth) The vertical (pitch) direction of the antenna is 36 degrees. Microwaves can penetrate through walls.So sometimes it is inaccuracies when microwaves penetrate to outside walls and detect moving objects in non-target areas. Be sure to choose an installation location to avoid this! When the microwave sensor does not detect moving objects, the indicator LED remains off. 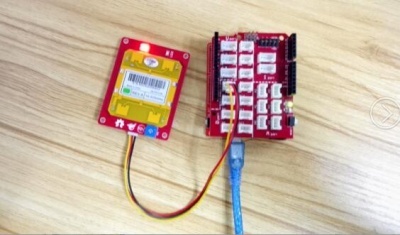 When the sensor detects moving objects, the LED will turn on and the output level will be change from HIGH to LOW. The LED will automatically turn off about after 0.5s and the output level will change from LOW to HIGH. If the microwave sensor detects continuously moving objects the LED will keep flashing on and off. The output level will fluctuate between HIGH and LOW until the object stops moving. The library of Microwave sensor we use that is MsTimer2. Place the MsTimer2 library folder your arduino sketchfolder/libraries/ folder. 1.Keep the Microwave sensor in a smooth. connect it onto the digital 2 port . attachInterrupt(pbIn, stateChange, FALLING); // Set the interrupt function, interrupt pin is digital pin D2, interrupt service function is stateChange (), when the D2 power change from high to low , the trigger interrupt. Serial.println(number); // Printing the number of times of interruption, which is convenient for debugging. if(state == HIGH)  //When a moving object is detected, the ledout is automatically closed after the light 2S, the next trigger can be carried out, and No need to reset. Convenient debugging. if(number>1)  //If in the set of the interrupt time the number more than 1 times, then means have detect moving objects,This value can be adjusted according to the actual situation, which is equivalent to adjust the threshold of detection speed of moving objects. number=0;   //If in the setting of the interrupt time, the number of the interrupt is not reached the threshold value, it is not detected the moving objects, Cleare the number. 3.The microwave sensor has a distance range of 2-16m. The detection distance can be adjusted using the potentiometer. If it is turned in the direction on MIN, the detection distance decreases. If it is turned in the opposite direction, the range increases.